The hosts are not out of the running for a playoff spot just yet but with just 7 games to go in the Euroleague regular season, Maccabi know that time is running out to grab the wins they need to propel them up the table. Their opponents are in a different position, looking for wins that will help keep them near the top of the table. This is a game between two sides who are very familiar with each other, and this is going to be the 15th time that this sides have clashed this century. 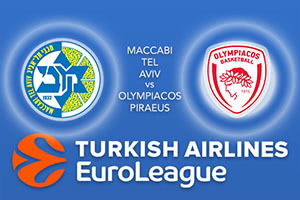 It is Maccabi who holds the lead at the moment with an 8-6 record, so there is all to play for. It was the Israeli side that triumphed in the last game, winning 73-80 in Greece. DJ Seeley provided 19 points in the win while the hosts were boosted by 15 points from Matt Lojeski, although it was in vain. Maccabi would normally look towards Andrew Goudelock who has provided an average of 17.3 points per game so far this season but he is unavailable through injury. Devin Smith is the player with the next best record, with an average of 9.8 points per game, but he too is not available for selection in this game. This means Maccabi will have to dig deep in this game and some of the squad players will have the chance to step up and make a difference. Olympiacos are also dealing with injuries at the moment and will be without Vassilis Spanoulis. Given that Spanoulis has offered an average of 12.9 points per game this campaign, his absence is a blow. However, Georgios Printezis will be asked to step up, and with a 12.8 point per game, he can do so, and Lojeski has a chance to improve on his 10.1 points per game record so far this season. With key players out, the game looks to be falling in favour of the away team and you can back Olympiacos Piraeus at -6, at odds of 1.90. If you are looking at the Over/Under market, go OVER 156.0 at odds of 1.90. Bet Now!